Mix all sauce ingredients; set aside. Heat wok over medium heat. Add the beaten eggs and cook until set. Turn egg to set the other side. Remove egg "pancake" from pan to a plate and let cool. When egg pancake is cool enough, cut into thin strips. 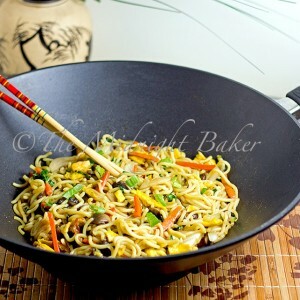 Return wok to medium heat. Add oil and heat until oil shimmers. Add the mushrooms, carrots and bok choi. Stir fry using non-metal utensil for 2 minutes. Add the Kame Hokkein noodles and stir fry for 2 additional minutes. Stir sauce again and add to pan, stirring to coat contents with sauce. Add cooked meat if using. Cook over medium heat, stirring constantly until sauce has thickened. Serve immediately.